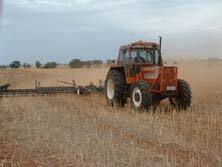 The idea of the Stubble Cruncher came from the continuous battle of getting canola stubble through our sowing implement. After resorting to mulching with a slasher, which gave a terrific result but was very expensive and slow, I started thinking there must be a better way. Then the rolling cutting action came to me after observing the effects of a bulldozer's track on the ground. Since the first version we have changed the cutting edges, added springs for downward pressure and up graded the bearings, which has developed the stubble cruncher into a very robust simple machine. 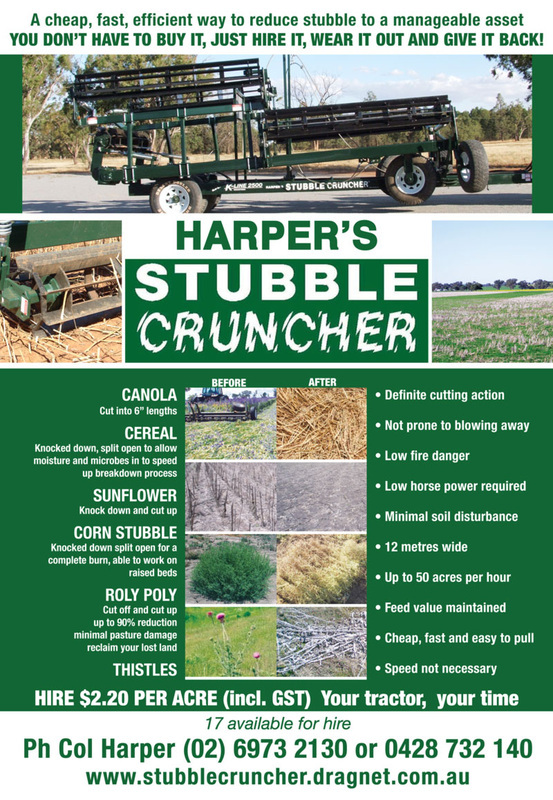 The Stubble Cruncher cuts canola stubble into six inch lengths in one pass with minimal soil disturbance and dust, leaving any stock feed value, eliminating eye injuries in stock, reducing the chance of disease carry over in a short rotation of canola wheat or similar. The Stubble Cruncher is not reliant on speed as it has a definite cutting action; therefore low horse power is required making it a very fuel efficient operation. In cereal stubble the Stubble Cruncher will knock it down and split it open every six inches which keeps the moisture in the soil. Moist soil means the stubble stays moist longer speeding up the break down process, while the splits every 6 inches break the waxy coating and allows the moisture and microbes into the stubble. Two passes can be made to double the affect as it will not bulldoze like harrows do, and at up to 50 acres per hour it is fast, cheap and efficient. All this and you still have your stock feed value as the Stubble Cruncher only touches the ground every 6 inches, so one is happy going in straight after harvest to knock the stubble down before a summer storm and pick up 2 months extra break down time. On heavier stubble a biological stubble digester can be used to improve the break down rate. Later in the season if stock have thinned out the stubble but you are not quite confident you will be able to get through it, the Stubble Cruncher can actually be more effective as the stubble has become more brittle with age. 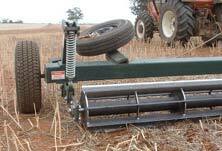 In corn stubble the Stubble Cruncher has been used in pivot irrigation and raised bed situations. Under the pivot the stubble was quite short after harvest and the Stubble Cruncher was able to chop it up and split it open enough to allow wheat to be direct drilled into the stubble. In the raised bed situation the Stubble Cruncher was used to knock down the tall standing stalks to give a complete burn, replacing the slow, expensive slashing option. Sunflower is another crop where the Stubble Cruncher has also proven to be a useful tool in managing this awkward stubble, knocking it down and chopping it up into six inch lengths. Stubbles are not the only application for the Stubble Cruncher, at Walget it has been working on Roly Poly, cutting it off at ground level and chopping up the top of the bush allowing native grasses to rejuvenate without harming the pasture that is already there and turning a prickly problem into valuable organic matter. The Stubble Cruncher has won Best Farmer Modified Machine at Central West Conservation Farming field day, awarded the Kondinin Group Award of Excellence as well as winning Machine of the Year at Orange National Field Day it is easy to fold up from the tractor seat and can be towed by a Ute for transport or put on a truck for longer distances. The Stubble Cruncher is for dry hire (your tractor, your time).